What a good looking mountain. I just finished Into Thin Air last night and have the climbing fever right now, just wish my budget agreed with it. This shot is so crisp and clear. The colors so vivid. Beautiful! @Jeff, it started for me with the same book, 3 years ago. Accept the fever and have fun with climbing, even when your budget is low, you can climb. If the fever is strong enough you need to climb and create the budget to do that. Harry, great shot even to know you are there right now ;-). Have fun. This is the most beautiful image of Aconcagua I have seen thus far. Any way this can be turned into a poster for sale? The story behind "Aconcagua at dawn from Casa de piedra, Argentina"
Aconcagua is the highest mountain outside of Asia, with 6962m altitude, and therefore one of the 7 summits. Just inside the border is is fully in Argentina. Shot 6 years ago in the early morning from the 2nd camp at the Vacas side, the entrance to the Polish glacier and traverse routes, scanned from provia slide. 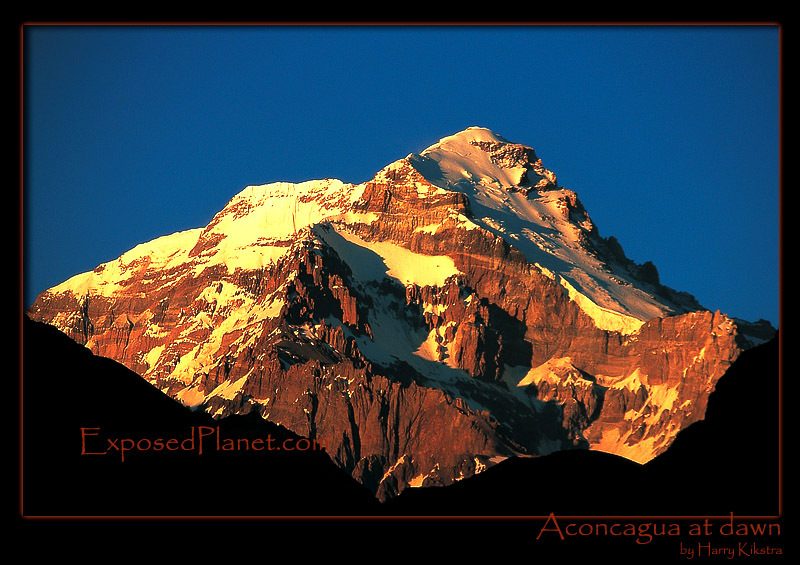 Aconcagua is the highest mountain outside of Asia, with 6962m altitude, and therefore one of the 7 summits. Just inside the border is is fully in Argentina.Shot 6 years ago in the early morning from the 2nd camp at the Vacas side, the entrance to the Polish glacier and traverse routes, scanned from provia slide.